For couples creating their own family in D.C., the choice of purchasing property to properly fit your family is one of the most important decisions you will make. I will always remember my first home. For me, it was a red brick single-family home that my parents purchased after the birth of their third child. Within its walls, I remember my formative years fondly, and every room of my childhood home will always be associated with memories. Although my first home was not in Washington, D.C., and instead in suburban Alabama, the idea of building a positive home for your family is universal. For couples creating their own family in D.C. and intending to put down roots, the choice of purchasing property to properly fit your family is surely one of the most important decisions you will make. In the same sense of planning for a child, purchasing a home for your family may take lots of time and consideration for you and your partner or spouse. And much like all markets, the market for family homes has gradually changed over time. In D.C., the trends for family migration appear obvious at first; that is, when families form, they tend to move out of the city center. Historically, areas like Capitol Hill and Cleveland Park have been staples for family formation. Over the past decade, with prices rising to an unrealistic level for some young families with children, the landscape of home ownership among families has changed. For the past decade, the outskirts of D.C. are primarily the biggest gainers in the proportion of married couples with dependents with neighborhoods such as Spring Valley, American University Park, Kent and the Palisades seeing about 5 percent growth in the proportion of families with children living in them. Additionally, D.C.’s closest suburbs in Maryland and Virginia continue to see an increase in the proportion of new families investing in property. Besides these neighborhoods with suburban tones, there has been an increase in families within Northeast D.C., especially Brookland and NoMa, both of which have seen an increase in the proportion of families living in the neighborhood growing around 3 percent. Another factor outside of price that drives a family’s move into a new home is the proximity to new schools. For some, private education is a necessity for their children. Thus, geographic location of home may not be a factor for the family unless the commute is prioritized. For other families, a home within a particular school district may be a priority especially given many couple’s diverse opinions of the D.C.-area schools. While it is obvious that many new families seek more space or a quieter neighborhood farther from the hustle and bustle of the city, it may not be as intuitive that after several years of relocating to a more suburban setting, some families find themselves relocating back downtown once their family has grown from its initial stages. For instance, families with a newborn may be more likely to move from their Logan Circle condo to an upsized single family home in Chevy Chase to increase space and grow their family. However, after forming their family and their children starting school, this same couple will possibly move back to the more urban setting. Most interesting in the discussion of the intersection between the role of real estate and family is that both are deeply personal life experiences. 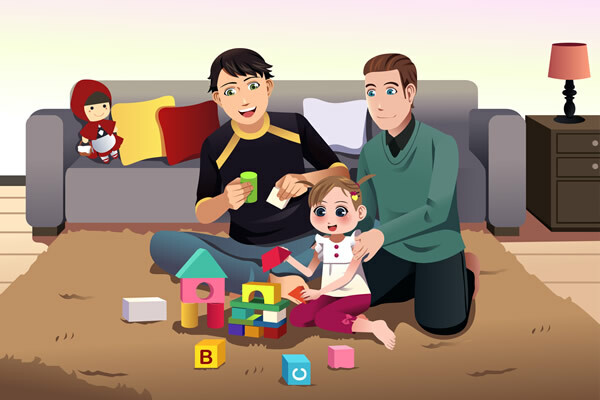 The formation of a family is inherently a goal for many couples, gay or straight. Paternal and maternal aspirations are just as much a priority to some as is the right to purchase, own and maintain real estate. Therefore, property has always been linked not just to purchasing a house, but also to building a family home where memories will be created and last forever. Tim Savoy is a real estate agent with Coldwell Banker Residential Brokerage, Dupont Circle. Reach him at 202-400-0534 or timothy.savoy@cbmove.com.